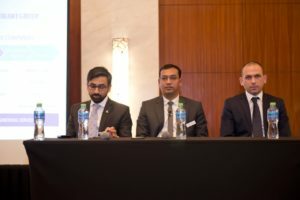 Dubai, UAE, 4 March 2019: Leminar Global and Clima Uno Air Conditioning hosted a seminar on IAQ with Performance and Precision Cooling in Data Centres, on February 27, 2019, at the Marriott Hotel in Dubai. Shaikh said: “In the normal course, you will tend to have leakages from the return air to the supply air in terms of contamination and this can happen due to a faulty mechanical seal. We try and refer to a case study from the ASHRAE journal, which deals with the impact of HVAC on IAQ. The case study, describes the amount of time required to dilute the build-up of formaldehyde in a room.” Highlighting an experiment, he said: “They studied this on an EATR of zero per cent, five per cent and 10% respectively. As a result, there was an increase in the dilution of formaldehyde. When tested at an EATR of 10%, the ventilation rate required increased by 2.38 minutes.” In the second phase of the experiment, he said, a similar test was carried out and the findings showed that an EATR of less than 15% has a low impact on IAQ levels and as the EATR decreased, OACF increased drastically. The second session on Precision Cooling in Data Centres was delivered by Diego Simone Bartucci, Area manager, Tecnair LV. Established in Italy, Tecnair has a big market in Poland, Russia, China, US and India, Bartucci said. “A part of our profit,” he said, “is spent on research and development and we also collaborate with the University of Milano and professors from the University come to our laboratory to teach.” The session broadly focused on the various methods of Closed Control Unit (CCU) solutions for data centres, while also focusing on other technologies and product advancements within Tecnair. Pointing to the P series, the G series and the R series as traditional, yet the most effective, solutions, Bartucci said, “The P series involves Perimetral installation, with an adjustable underbase of up to 600mm and a full range of accessories for temperature and humidity control.” The G series, he said, also involves Perimetral installation, the fans of which are installed inside the raised floor, along with a full range of accessories for temperature and humidity control. The R series involves an in-row installation, with air discharge on the front and the side, he added. Bartucci highlighted Tecnair’s Advanced Electronic Control System. He said: “The system can be connected to Modbus, BACnet, which provides control of the component. With configurable digital inputs and outputs, the system also offers optimised energy-saving components.” He also highlighted the Permanent Magnet DC inverter technology, which has a permanent magnet motor and a High-Pressure Shell (HPS) system. Bartucci then pointed to the Cooling Circuit Advanced Management System and said, “The system allows the monitoring of the circuit operating conditions, with the help of a remote BMS.” In addition, the Advanced Chilled-Water-Circuit Control, he said, can electronically control the water-flow and the inlet and outlet temperature. Also, it provides an automatic balancing of water-flow independently from the circuit pressure, he said. “A real-time monitoring of the water-circuit performance,” he said, “helps with water-circuit-efficiency optimisation.” Elaborating, Bartucci pointed to the three ways of optimising cooling and mentioned unit- and group-level as the most common. He said: “Unit-level cooling increases the room temperature, reduces humidity control and is high in efficiency, while having an increased cooling capacity. If we have a good air distribution system, it will reflect on the possibility of increasing unit return temperature.” The level of humidity in the room, he added, is linked to the SHR unit and the lower humidity set point allows maximisation of data centre cooling, while avoiding dehumidification. Elaborating on group-level he said that it is load-sharing that allows the units to work together, while exchanging information about the workload. As a result, he said, there is better and homogeneous air distribution across the racks with better energy savings. Pointing to the Advanced Local Network Control as the Smart NET system, Bartucci highlighted that the system helps manage the temperature, humidity, air flow and pressure with an active average function, thus ensuring there are no ‘hot spots’ in the room.